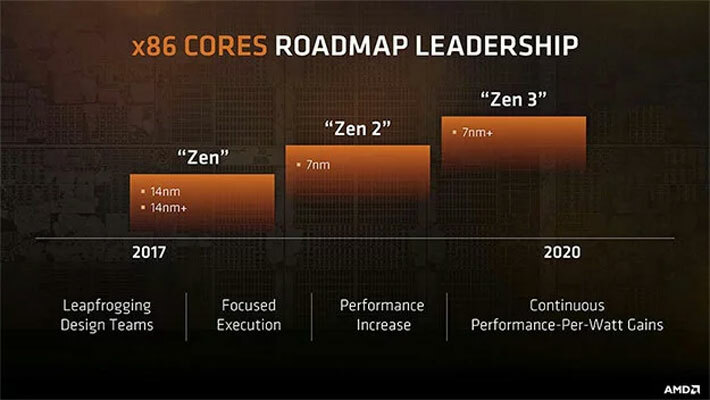 AMD's next-generation Ryzen CPUs may topple Intel from its performance throne for the first time in over a decade, as leaked specifications suggest the new chips could have as many as 16 cores at the top end, with boost frequencies reaching as high as 5.1GHz across them all -- and that's before overclocking. Better yet, the prices don't go any higher than $500, with most coming in substantially lower than that. The Zen+ generation of Ryzen 2000 CPUs was impressive, boosting frequncies across the board and delivering performance that competed very favorably with Intel at the mid-range and entry level, but still fell behind Intel's new 9th generation CPUs at the top end -- even if Threadripper demolishes them in multithreaded tasks. The Zen 2 chips though, could well change that. Ryzen 3 3300: 6 cores, 12 threads, 3.2GHz base clock, 4.0GHz boost clock -- $100. Ryzen 3 3300X: 6 cores, 12 threads, 3.5GHz base clock, 4.3GHz boost clock -- $130. Ryzen 3 3300G: 6 cores, 12 threads, 3.0GHz base clock, 3.8GHz boost clock -- $130. Ryzen 3 3600: 8 cores, 16 threads, 3.6GHz base clock, 4.4GHz boost clock -- $180. Ryzen 3 3600X: 8 cores, 16 threads, 4.0GHz base clock, 4.8GHz boost clock -- $230. Ryzen 3 3600G: 8 cores, 16 threads, 3.2GHz base clock, 4.0GHz boost clock -- $200. Ryzen 3 3700: 12 cores, 24 threads, 3.8GHz base clock, 4.6GHz boost clock -- $300. Ryzen 3 3700X: 12 cores, 24 threads, 4.2GHz base clock, 5.0GHz boost clock -- $330. Ryzen 3 3800X: 16 cores, 32 threads, 3.9GHz base clock, 4.7GHz boost clock -- $450. Ryzen 3 3850X: 16 cores, 32 threads, 4.3GHz base clock, 5,1GHz boost clock -- $500. If these specifications prove to be accurate and the new-generation offers even a few percent improvement in instructions per clock (we've heard as much as 15 percent in some cases) then AMD's new Zen 2 CPUs should be faster than Intel chips in single core tasks, or at least very comparable. In multithreaded tasks, though, they should completely walk away with it, making it hard to recommend an Intel CPU in 2019. We should see most of these chips debuted at CES, so keep your eyes peeled in the coming weeks for more info.